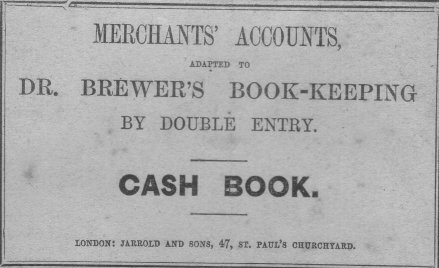 The document is an old (1861) Cash Book adapted to 'Dr Brewer's Book-Keeping'. On the front cover, there is a label, bearing some very fine calligraphy with the name 'Mr J W Beeson's Academy' and then 'Coldwell Street, Wirksworth'. The label is signed in ink: ' Walter Meller'. Inside there are various cash transaction entries in a beautiful rolling script. The entries refer to 'Norwich' and begin in January 1861. 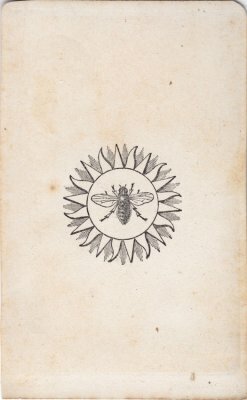 A label on the front of the book seems to indicate that it was used at sometime by Walter Meller, a pupil at James W.Beeson's Academy in Coldwell Street, Wirksworth. James Beeson came from Derby around 1860 to set up a private school for children after they left state education at 11 years old. Walter Meller was baptised in 1848 in Wirksworth, and at the age of 14 in 1862 he was perhaps using this old cashbook as a guide to learn book-keeping. 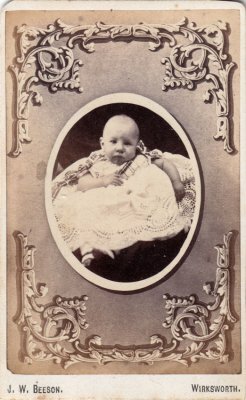 In 1851 Walter was staying with his grandparents Joseph and Hannah in Wigwell Grange, in 1861 with his parents John and Elizabeth in Brailsford and in 1871 was lodging in Litchurch as a joiner and builder. 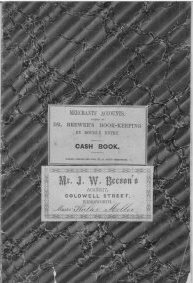 The cashbook itself is dated 1861, and entitled "Norwich" at the head of each page. White's 1857 Directory of Derbyshire lists: Joseph Stone, (Attorney), in Market Place, Wirksworth heading: "Norwich Union & Law, Fire and Life Office". Market Place joins Coldwell Street, and the Norwich Office was close to the Academy. 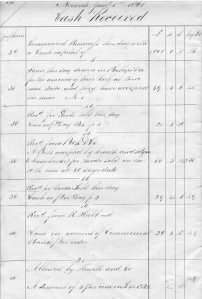 James Beeson and Joseph Stone were probably well known to each other, and Stone gave this old cashbook to Beeson for teaching purposes. 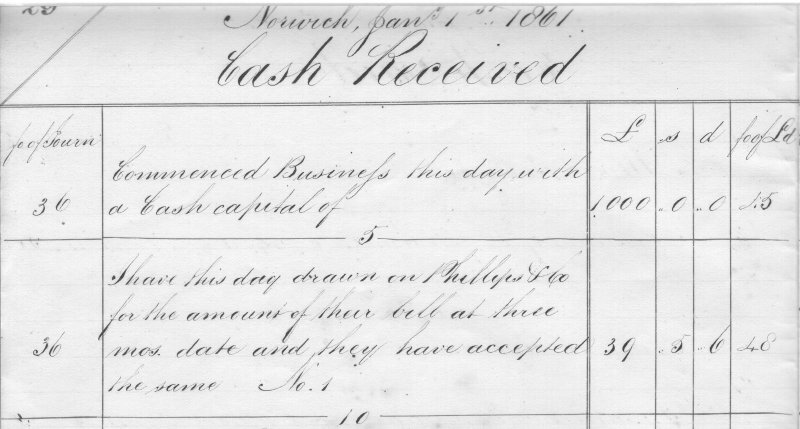 All 10 pages of the cashbook are written in fine copperplate script, and entries begin on January 1st 1861. 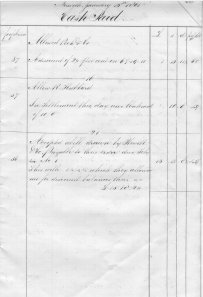 Transcription of the Cashbook (10 pages). have been one of his own children? Living at 15 Wilmot Street. for many years occupied by the late Mr. Woodford, Solicitor." Clerk of the works for the Midland Railway in Bedford. Piano teacher in 1901 Census. who died April 28 1857/aged 7 years/He was interred/ in Ecclesfield Churchyard/Yorkshire. (Marble headstone & Limestone kerb)"
I found your email address on the Wirksworth website. Mr J W Beeson of Wirksworth. The label is signed in ink: ' Walter Meller'. connection with Norwich would have been?